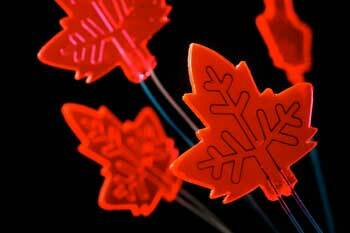 (Nanowerk News) Using sunlight for sustainable and cheap production of, for example, medicines. The 'mini-factory' in the form of a leaf that chemical engineers from Eindhoven University of Technology presented in 2016 showed that it is possible. Now the researchers have come with an improved version: their 'mini-factory' is now able to keep production at the same level, irrespective of the variation in sunlight due to cloudiness or time of the day. As a result, this boosts the average yield by about 20% (Green Chemistry, "Real-time reaction control for solar production of chemicals under fluctuating irradiance"). This is due to a clever feedback system costing less than 50 euros that automatically slows down or speeds up production. This has removed a significant practical barrier for green reactors that operate purely on sunlight.